Please note the picture shown is a tune up kit for a Saylor Beall Model 705. IF MANUFACTURED AFTER 8/7/80, THIS IS THE CORRECT KIT, 705 PUMPS MADE AFTER 1980 HAVE ALUMINUM RODS. To simplify ordering parts for single machine repair, tune up kits (TUKs) have been assembled which include. 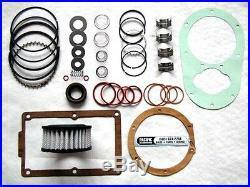 Gasket kit, piston ring kits, intake filter elements, insert bearings, valve discs, valve springs and oil. Seal, to recondition one compressor. We carry motors, compressor parts, rebuilding/tune-up kits for all major brands of air compressors. The item "SAYLOR-BEALL MODEL 705 REBUILD KIT AIR COMPRESSOR PARTS FITS MODEL 705" is in sale since Wednesday, November 12, 2014. This item is in the category "Business & Industrial\Light Equipment & Tools\Air Compressor Parts & Accs\Other Air Compressor Parts". The seller is "pacificaircompressors" and is located in Portland, Oregon. This item can be shipped to United States.